In addition to the collection of overseas information via the Internet, JPEC’s researchers residing in Europe (Brussels, Belgium), the U.S.A. (Chicago) and China (Beijing) also gather firsthand local information. 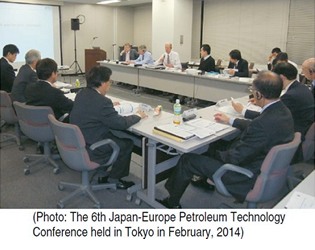 JPEC has been sharing information with organizations specializing in energy and petroleum worldwide in an effort to build a global network of petroleum-related information. JPEC has been promoting technology exchanges with Asian countries, focusing on technical issues related to petroleum technology policies, refining facilities, and fuel oil quality. These exchanges have helped develop an information network as well as strengthen the relations with government-affiliated organizations and oil companies in each of the Asian countries concerned. In December 2013, JPEC’s office was established in China (Beijing), a country that is expected to see a continued rapid increase of domestic energy demand. A researcher from JPEC is residing in Beijing for collecting local information. 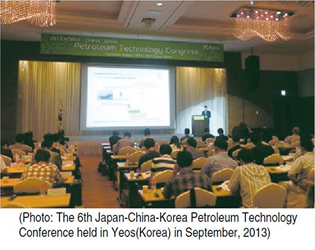 JPEC, Chinese Petroleum Society, and Korea Institute of Petroleum Management (K-Petro) jointly hold an annual conference for exchanging information on the latest petroleum technologies in the three countries. Thailand is among the advanced countries in the ASEAN members in terms of petroleum-related technologies. JPEC and PTT, a state-run oil company of Thailand having congress annually for, exchange information on fuel quality, biofuels and refining technologies. Information is also collected regarding the status quo and the future trends in fuel quality and biofuels in Asia. JPEC participates in workshops of the ASCOPE consisting of ten ASEAN members for gaining a better understanding of the trends in the regulations on fuel oil quality as well as in biofuel technologies in Asia. JPEC also takes advantage of the workshops for informing the participating countries of Japan’s technologies for energy saving, heavy oil cracking, and catalytic cracking for the purpose of developing a network of personal connections with management personnel from state-run oil companies of the ASEAN members. Information obtained in the workshops is utilized for developing information bases relevant to the ASEAN member countries. Researchers have been sent to Chicago, the U.S.A., for an extended period of time for meeting with officials of major U.S. government agencies and energy-related organizations including the Department of Energy (DOE) and the Environmental Protection Agency (EPA) for exchanging up-to-date information. They also collect the latest information about the energy policy directions, technological developments implemented on the basis of the anticipated energy policies, and environmental protection measures. Researchers Have been sent to Brussels, Belgium, for an extended period of time to meet with officials of major government affiliated agencies and energy-related organizations including the European Commission (EC), European oil companies, Conservation of Clean Air and Water in Europe (CONCAWE) , and International Petroleum Industry Environmental Conservation Association (IPIECA) for gathering information on EU’s initiatives in addressing environmental concerns, improving fuel quality, and developing technologies. Regarding the fuel oil quality specifications, the trends in the environmental regulations, and the technological issues in Europe and Japan, JPEC exchanges information with CONCAWE, an organization affecting policymaking in Europe from the viewpoint of technological issues. All the information that JPEC collects in the meeting is useful for formulating policies, projects and strategies in the related fields in Japan.